Saturday March 19th "Semana Santa takes over a city (and a page)"
Every year I notice something different as Semana Santa nears. This year I had less time, with an early arrival date of March and a much heavier workload. Still, it is easy to see how Semana Santa takes over the city, especially the center. Activity – physical, mental and economic – begins to stir many months before the start. As you near a month before Palm Sunday things begin to kick into high gear. You hear a band or two practicing by the river, and churches open their doors so you can see the floats, or pasos, as they are being prepared for the processions. Smaller processions, the Via Crucis, begin over the weeks leading up to Semana Santa, and people line up in a sort of preview of what is to come. During a slow weekend night you may see a group of costaleros carrying a bare wooden frame, weighted with sand bags, practicing for the twists and turns of their routes. In anticipation of the week people hit the streets the weekend before for tapas and beers. Many do this to get a little practice in for the long hours to come in the following week, while others try to enjoy a last meal out before the crowds take over. Then a little economy which lies dormant for 11 months out of the year turns to a very big one. Dry cleaners offer specials for the robes, or tunicas worn by the nazarenos. 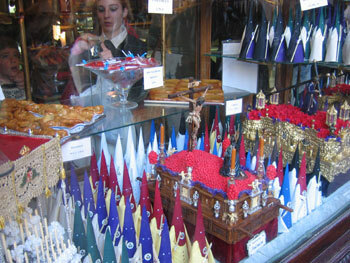 Shops which specialize in candles, or cirios bring in large shipments for the cofradias. Others sew capirotes, the pointed cardboard hats worn under the cloth hoods. Incense vendors on the street become more and more popular. The activity spills into everyday businesses – pastry shops prepare torrijas, a typical sweet consumed on Palm Sunday and throughout the week. Tons of bread is baked to supply them, and to make all of the bocadillos and sandwiches for hungry masses too tired to prepare a meal. Florists provide flowers for the pasos and for people wishing to shower them with rose petals along their routes. Clothing and shoe stores get a lift from everyone updating their wardrobe for Palm Sunday. Comfortable shoes, knee braces and other aids are purchased by costaleros and nazarenos as they ready themselves for the long walks. Barbers cut hair, so everyone looks their best. Supermarkets are crowded as everyone makes a run for their supplies. Hotels and hostals book their last rooms and deal with an amazing amount of phone calls and emails for those seeking last minute accommodation. Meanwhile bars and restaurants may close for a day to clean and get ready for non-stop service, some almost 20 hours per day. Other bars which were closed during the year clean out the cobwebs and dust to open for just this week. Some stores simply take advantage of their location to sell drinks and snacks. Delivery men can be seen on every street corner in the center, with every kind of beverage imaginable stacked high, as bar owners try and make space to store it all. Temporary help is hired, just about everywhere, to deal with the expected masses. Semana Santa music can be heard from most any store or bar. Then t here is the organization and planning that any city must go through. Many months before there is careful consideration of construction work, and some routes are altered where the streets may be temporarily impassible for the processions. Firemen walk the routes to note any possible danger that a street or building may present (lots of candles in these processions!). The bleachers are erected and in what appears to be the very last minute, and still seem to need a lot of work as late as the 18th of March. Metal gates are set-up to guide the masses moving in proper direction around calle Sierpes. Also erected are small, sheet metal walls designed to block the view of passers-by in areas where crowd movement is especially important to keep order. The official schedule is decided, making sure each procession has a thirty minute window to enter the Cathedral. Publishers and print companies work to get the booklets with schedules out to everyone. Seeing how much it takes over the city you can see why so many flock to the center to take part in the events. You can also see why so many flee the center for the comforts of the beach or the country-side, looking for a little peace as the crowds take over their neighborhoods. And as the event consumes Seville’s center, it also consumes my page and life for a month.